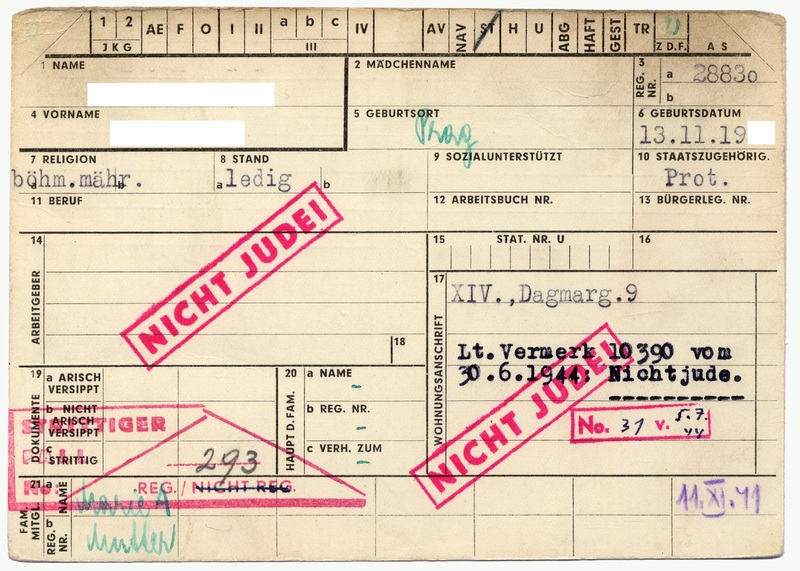 Preserved remnants of registration card files of Jews in the Protectorate Bohemia and Moravia open important questions of the state of Holocaust documentation as well as of the deployment of modern technology in registering and deporting European Jews. This post analyses the history and structure of the WWII central card file held today at the Federation of Jewish Communities of the Czech Republic. The analysis of the card files of the Jewish population in the Protectorate Bohemia and Moravia starts with destruction and void. The majority of the cards from the registration card file did not survive World War II. With the end of the war approaching, while Nazis were covering up the traces of the “Final Solution”, cards of the deported people were systematically destroyed along with other documentary material. Neither the related documents of the SS, especially of the Central Office for Jewish Emigration in Prague (Zentralstelle für jüdische Auswanderung Prag / Ústředna pro židovské vystěhovalectví v Praze), nor the larger part of the materials of the Jewish “self-government” have been preserved. Immediately after the war, its remnants became part of the newly established Auxiliary card file and the Central card file which merge pre-war and post-war cards. Since the cards of deportees were continuously discarded and destroyed, the contemporary Central card file consists mostly of cards of mixed-marriage Jews, hidden persons, of those who died in the Theresienstadt ghetto, etc. Later on, data from transport lists were added. Thus, the Central card file contains of more than 160 000 cards of various types3, mostly created after WWII. Cards stamped with Haft (imprisonment) – people caught while hiding, violating anti-Jewish regulations, Jewish members of resistance movements etc. The card file itself was created in September 1939 to record the Jewish population on the territory of the Protectorate. Established by order of the Central Office for Jewish Emigration in Prague, it was managed by the Jewish Religious Community in Prague. For further information on the Jewish Religious Community and the “Jewish Council” in Prague visit the “Jewish Councils” Research Guide. Every single registration card contained the following information: registration number, surname, first name, date of birth, citizenship, number of children, marital status, profession, address, the information whether the person lived in a mixed marriage, details of assets (real estate, cash, bank cash, receivables, securities, jewellery, furniture and everyday objects, mortgages, debts, passport, occupation and special expertise). On the reverse, the cards recorded names of family members – their registration numbers, birth dates, and, if there were any, details concerning cohabitation. In Prague, the registration was completed by the end of November 1941, and was followed by the registration of Jews of other Jewish Communities in the territory of the Protectorate. In some “Oberlandrat” districts, the registration has been completed within a few days. Employees of the Registration Department recorded all population status changes: birth, death, marital status, address changes. As evidenced from this blog post, up until now, we know very little about registration card files and their processing, which were used by the Nazis’ bureaucratic apparatus in the territory of the Protectorate of Bohemia and Moravia. Simultaneously, original Hollerith cards preserved in registration card files represent silent witnesses of modern automation technology used by Nazi authorities to gather and utilise coveted information about the Jewish population at the time. One does realize that Ed Black, in the monumental volume on IBM and previously, used the original cards or a part of them, stored in the Yad Vashem archives’ collections? As of course, the director of its arhcives, Haim Gertner knows well, I hope?